Posted on March 19, 2008	by Linda S.
So I grabbed a couple of dowel rods and some wool yarn that has been hanging in my work room for at least 4 years and went to work. 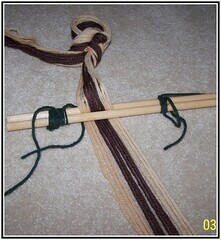 The instructions said to tie one end of the two rods together..did that…then place the yarn in color sequence inside the double rod and secure the other end…did that… The sequence for this trial is three cream, 6 chocolate brown, 3 cream. The instructions said to place them inside the rods at their half point and weave one end then the other if you want your arrows in this pattern… <<<<>>>>… so that is what I set out to do. 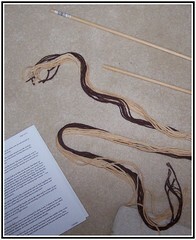 I found that as I began to weave the pattern, the long woolen strands would become confused and stick together on the ends. I considered winding them on spools but I don’t have enough… besides I needed to be able to easily and quickly unwind when the strands became too short… so I came up with the idea to cut strips of doubled and folded aluminum foil, wind the yarn onto the center from the end to the point I wanted to stop, then fold over the ends holding the yarn in place. This worked really well for the process. If you find (as I did) that you have fallen asleep somewhere in the process and missed something about 9 or 10 rows back…yuk… be aware that you must unwind exactly the way it was put in. This means lifting the yarn in pattern for each step backwards or you will end up as I did with all the yarn strands hanging down and no pattern to refer back to when you want to restart weaving. So I stopped and braided the ends on this side. Now I turned it over to the other side to weave that side and I found that the weaving didn’t seem to want to just continue on with the pattern on the reverse side. 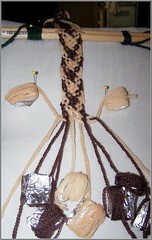 The yarn colors were in the wrong places to just start with step 2 (as step one had already been done on the reverse side). Perhaps I should be working it backwards and beginning with step 3…hmm Anyway, if there are any finger weavers out that, a little nudge on what to do here would be greatly appreciated. This entry was posted in Card Weaving, Crafts, Handcraft, Handwork, Historical Textile, Spindling, Spinning, Tablet Weaving, Tutorials, Weaving. Bookmark the permalink.